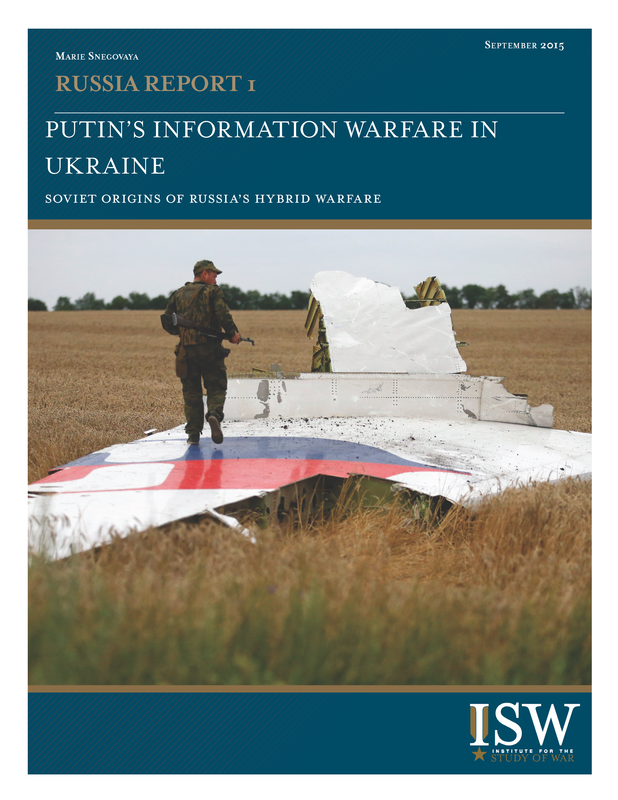 Russia has been using an advanced form of hybrid warfare in Ukraine since early 2014 that relies heavily on an element of information warfare that the Russians call “reflexive control.” Reflexive control causes a stronger adversary voluntarily to choose the actions most advantageous to Russian objectives by shaping the adversary’s perceptions of the situation decisively. Moscow has used this technique skillfully to persuade the U.S. and its European allies to remain largely passive in the face of Russia’s efforts to disrupt and dismantle Ukraine through military and non-military means. The West must become alert to the use of reflexive control techniques and find ways to counter them if it is to succeed in an era of hybrid war. Reflexive control, and the Kremlin’s information warfare generally, is not the result of any theoretical innovation. All of the underlying concepts and most of the techniques were developed by the Soviet Union decades ago. Russian strategic theory today remains relatively unimaginative and highly dependent on the body of Soviet work with which Russia’s leaders are familiar. Russian information operations in Ukraine do not herald a new era of theoretical or doctrinal advances, although they aim, in part, to create precisely this impression. Russia’s information warfare is thus a significant challenge to the West, but not a particularly novel or insuperable one. It relies, above all, on Russia’s ability to take advantage of pre-existing dispositions among its enemies to choose its preferred courses of action. The primary objective of the reflexive control techniques Moscow has employed in the Ukraine situation has been to persuade the West to do something its leaders mostly wanted to do in the first place, namely, remain on the sidelines as Russia dismantled Ukraine. These techniques would not have succeeded in the face of Western leaders determined to stop Russian aggression and punish or reverse Russian violations of international law. • The deployment of a vast and complex global effort to shape the narrative about the Ukraine conflict through formal and social media. The results of these efforts have been mixed. Russia has kept the West from intervening materially in Ukraine, allowing itself the time to build and expand its own military involvement in the conflict. It has sowed discord within the NATO alliance and created tensions between potential adversaries about how to respond. It has not, however, fundamentally changed popular or elite attitudes about Russia’s actions in Ukraine, nor has it created an information environment favorable to Moscow. Above all, Russia has been unable so far to translate the strategic and grand strategic advantages of its hybrid warfare strategy into major and sustainable successes on the ground in Ukraine. It appears, moreover that Moscow may be reaching a point of diminishing returns in continuing a strategy that relies in part on its unexpectedness in Ukraine. Yet the same doctrine of reflexive control has succeeded in surprising the West in Syria. The West must thus awaken itself to this strategy and to adaptations of it.